NOTE: George Pérez did not contribute to this issue. This special contains a short story and a whole bunch of pin-ups by a variety of artists, among other things. At $ 5.95, this is a fairly good performance. Errata: Review of "Astro City: A Visitor's Guide"
It was fun seeing the world of Astro City from so many different artistic perspectives. It's basically been Alex Ross and Brent Anderson from the start, so these other interpretations were a nice change of pace. I was surprised at the lack of involvement Ross had in this book. In the original series, Ross's design sketches were often included in each issue, and I miss those behind-the-scenes elements. News: Astro City - No Pérez! I picked up ASTRO CITY: A VISITOR'S GUIDE, and while the book is a must-have for Astro City fans, there is no contribution from George within its pages. Diamond published their official shipping list and ASTRO CITY: A VISITOR'S GUIDE is confirmed to ship for this week. Shipping was apparently not affected by Columbus Day or Thanksgiving (Canada). - Mike Perkins will be inking him on Titans: Games, since George was so impressed with the results of their previous collaborations. The pages already inked by Al Vey will see print as they are. - He drew 2 covers and 5 interior pages for the cancelled Sojourn/Lady Death. One thing I forgot to ask him was whether his work would appear in Even More Fund Comics. He was originally announced as a contributor, and the book was apparently made available at the Baltimore Comic-Con this past September 11-12, so I'm curious to look at it when it hits comic store shelves. For years, Astro City has been a favorite destination for readers. This fall, DC Comics/ WildStorm Productions will acquaint new readers (and reacquaint longtime fans) with Kurt Busiek's rich world with Astro City: A Visitor's Guide (AUG040440, $5.95). Written by Busiek, the 48-page guide will showcase the neighborhoods, businesses, sights, and colorful heroes of Astro City with stunning illustrations by Brent Anderson & Ben Oliver, George Pérez, Carlos Pacheco, Dave Gibbons, Michael Golden, Jason Pearson, and others. In addition, the guide will contain a special, all-new, eight-page story by Busiek, Anderson, and Ben Oliver, and will serve as a set-up for the upcoming Astro City: The Dark Age mini-series. Featuring a cover by Alex Ross, the book is set to ship on October 13. Travelers seeking an early start to their journey in the big city should be directed to DC's Astro City collections, including the Confession TP (STAR08680, $19.95), Family Album (HC-STAR09778, $29.95; TP-STAR09174, $19.95), the Life in the Big City TP (STAR08671, $19.95), and the Tarnished Angel TP (STAR13461, $19.95), available from many fine comics retailers. Planning a getaway this holiday season? Searching for a new or exotic locale to take the family? Look no further than Astro City! 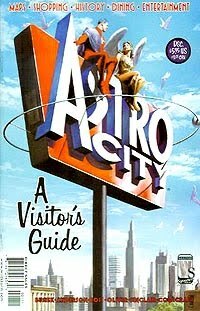 Everything you need to know about the city and its many special places and faces is in one handy volume: ASTRO CITY: A VISITOR'S GUIDE! This cleverly designed guide features all the info you need about Astro City: neighborhood guides, restaurant recommendations, highlights, local interests, ads for local businesses, and even a guide to the who's-who of the hero elite, illustrated by such fan-favorite artists as George Pérez, Carlos Pacheco, Dave Gibbons, Michael Golden, Jason Pearson and more! Plus, a special treat for all potential visitors: an all-new 8-page story illustrated by Brent Anderson and Ben Oliver! Re: But What's Next? . . .
George and I have talked about doing another project -- a pretty big one too -- after he finishes GAMES, but that'll be a ways off.